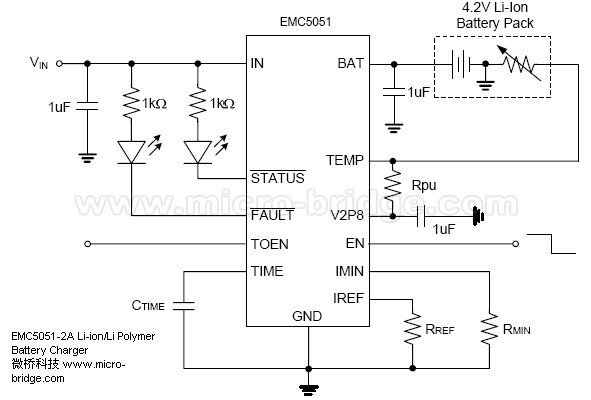 The EMC5051 is a highly-integrated battery charger for single-cell Li-ion or Li-polymer batteries capable of operating with an input voltage reached 2.5V. It is a complete charger device designed to work with an USB port or 5V output AC adapter. The EMC5051 operates with CC (constant current) mode and CV (constant voltage) mode profiles. A low-current preconditioning charge mode is also provided as a trickle charging operation. 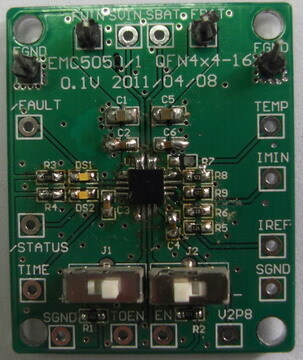 The charge current is programmable up to 2A with an external resistor or a logic input. The charge voltage is 1% accurate over the full application range. When operating with a current-limited adapter, the charger minimizes the thermal dissipation with pulsed operations to prevent overheat conditions that is commonly occurred with conventional linear chargers. The EMC5051 reduces charge current for thermal fold-back to ensure product safe operation.